Various surgical techniques to release temporomandibular joint (TMJ) ankylosis have been described in the literature. 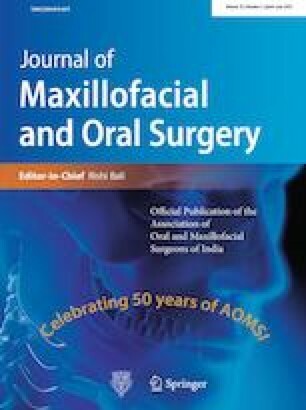 The purpose of this paper is to report our Institution’s experience regarding the post-surgical outcome of different surgical techniques for the release of ankylosis of the TMJ. The records from our hospital of 386 patients (521 joints) treated for TMJ ankylosis were reviewed. Data analysis included the etiology of TMJ ankylosis, gender distribution, age group, distribution of ankylosis based on location, type, interincisal opening and complications in the perioperative period. Out of 521 joints, 65.02% were unilateral and 73.89% had bony ankylosis. The mean maximal incisal opening preoperative was 5.4 mm (SD 3.63 mm) and at 1-year follow-up was 36.9 mm (SD 3.3 mm). There was no permanent facial nerve paralysis. However, transient facial nerve paresis was 14.78%. There was an overall recurrence rate of 8.82%. We conclude that after TMJ ankylosis release with interpositional arthroplasty, reconstruction of the RCU with L ramus osteotomy is the most favorable. This procedure not only causes least complications, but also maintains height of ramus, facilitating surgeries for secondary asymmetry correction. We sincerely thank our former Head of Dept. of GDCH, Ahmedabad, Dr Babu S Parmar for his contribution toward patient’s surgical work in the Department in his tenure. All procedures followed were in accordance with the ethical standards of the responsible committee on human experimentation (institutional and national) and the Declaration of Helsinki of 1975 that was revised in 2000. Written informed consent was obtained from the patient before their inclusion in the study with the approval from ethical committee. The procedure was explained to them regarding the nature and benefit of the study.